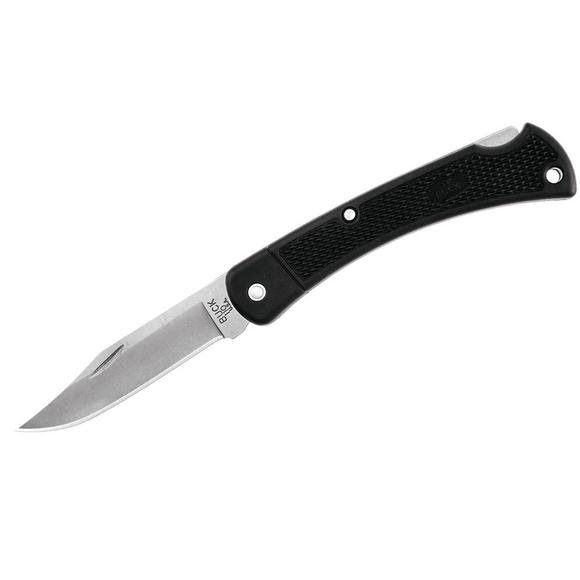 The 110 Folding Hunter® from Buck Knives is one of America's favorite knives, this version, the 110 Folding Hunter® LT, will undoubtedly follow in suit. Weighing barely over 3 ounces, the LT is created with lightweight molded nylon, drastically reducing its weight while maintaining the same quality as the original Folding Hunter®. The 110 Folding Hunter® from Buck Knives is one of America&apos;s favorite knives, this version, the 110 Folding Hunter® LT, will undoubtedly follow in suit. Weighing barely over 3 ounces, the LT is created with lightweight molded nylon, drastically reducing its weight while maintaining the same quality as the original Folding Hunter®. The clip point blade is finished with Buck&apos;s advanced Edge2x blade technology for unbelievable sharpness and edge retention out of the box.